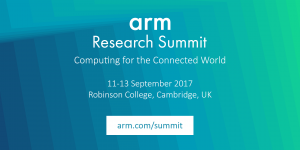 The second annual Arm Research Summit was an academic summit to discuss future trends and disruptive technologies across all sectors of computing. It took place in Cambridge from 11 to 13 September 2017, and was hosted at Robinson College. The Summit included talks from the leaders in their research fields, demonstrations, networking opportunities and the chance to interact and discuss projects with members of Arm Research. The project coordinator Denis Dutoit (CEA) presented ExaNoDe as part of the Collaborative Research Projects Workshop which took place on 13 September.